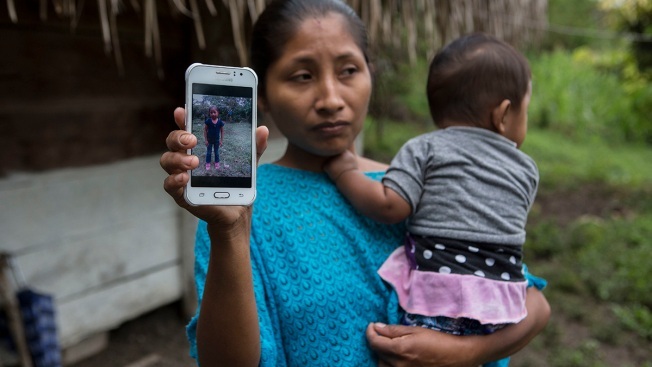 In this Dec. 15, 2017, file photo, Claudia Maquin, 27, shows a photo of her daughter, Jakelin Amei Rosmery Caal Maquin in Raxruha, Guatemala. The 7-year-old girl died in a Texas hospital, two days after being taken into custody by border patrol agents in a remote stretch of New Mexico desert. The body of a 7-year-old girl who died while in custody of the U.S. Border Patrol arrived in her native Guatemala on Sunday and was being driven hours into the countryside to be handed over to family members for a last goodbye. A white coffin containing Jakelin Caal was received in the afternoon at Guatemala City's international airport by representatives of the country's Foreign Ministry and then loaded into the back of a black hearse by workers in orange vests. No family members were on hand. Domingo Caal, the girl's grandfather, told The Associated Press that the family didn't have money to travel from their poor hamlet to Guatemala's capital. At Domingo Caal's home in the village of San Antonio Secortez, in the department of Alta Verapaz, relatives set up a small wooden altar flanked by vases overflowing with flowers, with photographs of Jakelin and the hand-lettered message, "We miss you." Behind the house, dozens of women prepared tamales and beans to feed mourners. Relatives expected the body to arrive in the pre-dawn hours Monday in the hamlet of about 420 people who mostly live off growing of corn and beans. The village has no paved streets, running water or electricity, and residents say declining crop yields and a lack of work have pushed many in the community to emigrate in recent years. Caal and her father, Nery Caal, were traveling with a group of 163 migrants who arrived at the New Mexico border earlier this month. After they were taken into custody Dec. 6, the father told a U.S. agent that the girl was sick and vomiting. The father signed a paper stating that Jakelin was in good health, but it is not clear how much he understood what it said. The form was in English, and agents read it to him in Spanish. A bus carrying the two left the Antelope Wells port of entry for the Lordsburg station, roughly 90 minutes away. By then, according to a Customs and Border Protection statement, Jakelin's temperature had reached 105.7 degrees Fahrenheit (40.9 degrees Celsius). Emergency medical technicians had to revive her. She was then flown to a hospital in El Paso, Texas, where she died the next day. Domingo Caal said his son has a Jan. 3 court date in the United States to determine his migratory status. Associated Press writer Sonia Perez D. contributed to this report. Shortly before a 7-year-old Guatemalan girl died in U.S. custody, her father signed a form stating that his daughter was in good health. But it's unclear how much the man understood on the form, which was written in English and read to him in Spanish by Border Patrol agents. The death of Jakelin Caal highlights the communication challenges along the U.S.-Mexico border as agents come in contact with an increasing number of migrants who speak neither English nor Spanish. Her father's native language is the Mayan tongue known as Q'eqchi'. His second language is Spanish. It's unclear whether something was lost in translation or whether it would have made a difference in saving Jakelin after the two were detained and underwent a health screening along a remote stretch of U.S.-Mexico border. But the case raises questions about the Border Patrol's use of English-only forms. All agents are required to speak Spanish, and they receive formal Spanish training. Reading forms in Spanish is often enough to pose basic questions. But some other Spanish-speaking migrants reported signing paperwork that they later said they did not understand. Scores of immigrant parents who were separated from their children after crossing the border in the spring said they signed forms agreeing to be deported with the understanding that their kids would be returning with them, only to find themselves deported without them. Many had to wait months before being reunited with them in their homelands. Jakelin and her father, Nery Gilberto Caal Cuz, were part of a group of 163 migrants arrested Dec. 6 near a border crossing in New Mexico. Hours later, they were placed on a bus to the nearest Border Patrol station, but Jakelin began vomiting and eventually stopped breathing. She later died at a Texas hospital. Border Patrol officials on Friday said agents did everything they could to save the girl but that she had not had food or water for days. An initial screening showed no evidence of health problems, they said, and her father spoke to them in Spanish and signed a form indicating she was in good health. Attorneys in Texas representing Caal criticized U.S. officials for asking him to sign Form I-779, which asks a series of questions with check boxes of "yes" or "no." In the additional comments section on the form was written "claims good health." "It is unacceptable for any government agency to have persons in custody sign documents in a language that they clearly do not understand," the attorneys said in a statement. The family also disputed the accounts offered by U.S. officials that the girl walked for days in the desert without food or water before crossing. The father's lawyers said Caal took care of his daughter, giving her sufficient water and food, and she appeared to be in good health. Jakelin's family is asking for an "objective and thorough" investigation to determine whether officials met standards for taking children into custody. Border Patrol officials did not immediately respond to the family lawyers' statement. The father, who is staying at a shelter in El Paso, Texas, has asked for privacy. Authorities are conducting an autopsy to determine the cause of death. Results are expected in about a week, said Tekandi Paniagua, the Guatemalan consul in Del Rio, Texas. Paniagua, who spoke with Jakelin's father, said the two had walked with the other migrants for about 90 minutes before crossing and Caal told him he had no complaints about how agents treated him and his daughter. Caal speaks broken Spanish. In his impoverished village in Guatemala, Spanish is needed only occasionally, such as when the community deals with schools and health care or for work, Paniagua said. 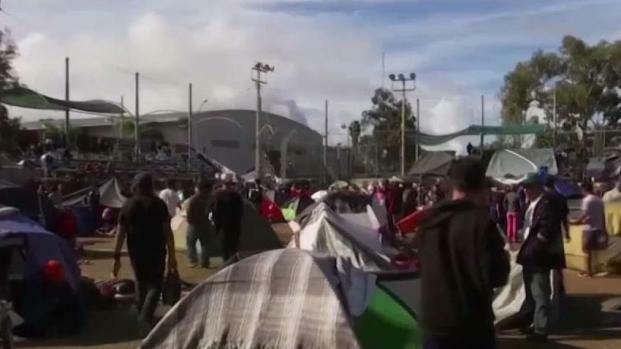 More than two dozen languages are spoken in Guatemala, and the consulate tries to send interpreters as soon as possible to help detained migrants, Paniagua said. But sometimes by the time they get there, the migrants have already signed forms. "We'll ask, 'Do you speak Spanish?' And they'll say yes," he said. "Then we'll ask, 'But do you understand Spanish?' And often they'll say, 'No, I need an interpreter.'" Caal asked the Guatemalan consulate in Texas, which had reached out to him, if he could see his daughter one last time before her body was sent back to her homeland. That request prompted special arrangements at a private funeral home on Friday, when he said goodbye to Jakelin. He said he did. After listening to the interpreter, Paniagua said, Caal thanked the consulate and said "he felt more comfortable in his own language.